Sample tweet: "Dear GAM, "This might be a stupid question--" Girls, there's no such thing as a--"Do fish, like, drink water?" Never mind, stupid question." 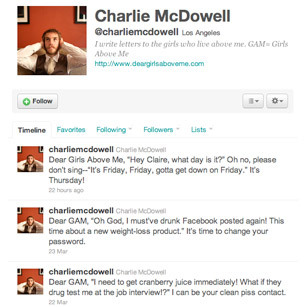 Charlie McDowell's Twitter feed is simple: he pens short letters, all beginning with the phrase "Dear Girls Above Me," referring to two impossibly ditzy girls who live in his apartment complex. Since the building has thin walls (and, clearly, floors), McDowell overhears almost every inane thing the superficial neighbors talk about  which he gladly shares on Twitter, adding his own comments and responses. McDowell has said each tweet is based on an actual conversation he overheard and that the girls have no idea that he's recording what they say. It sounds a little cruel  until you read just how silly these girls are  but after a while, you get the sense that McDowell has genuine affection for his neighbors. And he should, considering that their conversations have inspired one of the most hilarious Twitter feeds out there. See TIME's June 2009 cover story about Twitter.